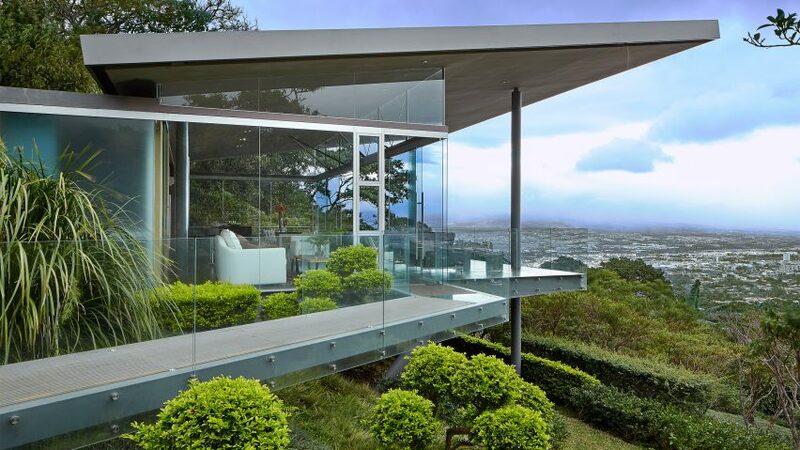 Extensive glazing across this house in Costa Rica by local firm Cañas Arquitectos provides vistas of the verdant landscape by day and the twinkling city below at night. The property, named Estancia y Ficus, is situated on the crest of a hill overlooking Costa Rican capital San Jose. The site features a tropical, cultivated tree referred to in Spanish generally as a "ficus". Cañas Arquitectos wanted to both draw attention to the plant and make the most of the surrounding vistas. "The location selected had a slight slope towards the east and a bonsai-like tree that resembles those which are attentively cultivated," said the architects. "The aim became to bring in the space to accompany the plant, as well as to highlight the location." Hidden behind vegetation, a perforated steel catwalk extends around the slope to provide access from the driveway. A ceramic-tiled platform extends eastward over the hillside, offering a panorama of the city below. Glazing set into a steel frame encloses most of the floor plan. The remainder serves as a terrace with glass-pane railings. The transparent partitions preserve the continuity of the vista from across lounge – taking full advantage of the site's vantage point. From the concealed service rooms at the west end of the plan, a high roof slants up towards the view. Metal columns burrowed through the floor and anchored into the ground beneath support the roof at its east end. As the day progresses, the dominant subject of the scenery shifts. "The view of the San Jose with the volcanic mountain range as a backdrop is spectacular – the Escazu mountains and the White Peak feel so close, it's as though you can touch them," said the architects. "Towards night, the city begins to glow and becomes the main attraction." The architects designed the interior to further highlight the view as the focal point. "Dark ceramic tile was chosen for the floor, and the ceiling was painted grey so as to leave the room in semi-darkness during the evening and to avoid competition with the city lights," said the firm. "The furniture and the wall colours all complement the style," they added. Costa Rica's tropical landscape also provides a lush setting for a house elevated above a canopy of trees, and a residence featuring indoor and outdoor spaces. Photography is by Jordi Miralles.